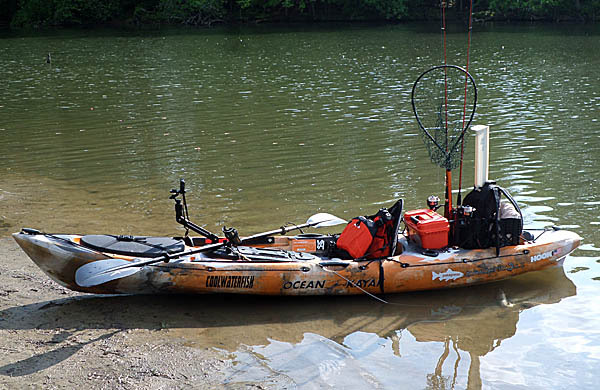 Behind the scenes, for at least a year, I had been considering getting deeper into the sport of kayak fishing. While I have had a cheap recreational kayak for many years, it was a big decision to fully invest all the resources necessary to take it to the next level. 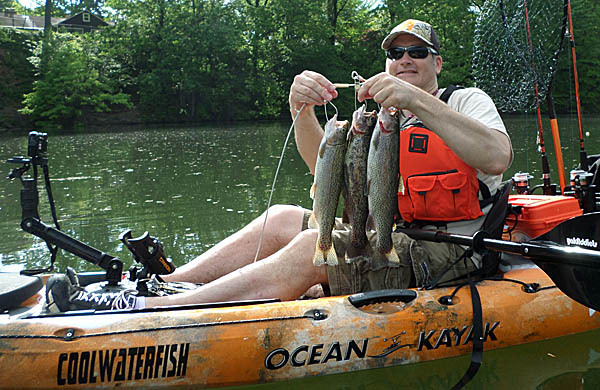 Kayak fishing has evolved into a niche within the angling community that you could literally devote every aspect of your recreational time to. While I am still just scratching the surface of custom- ization and all aspects of rigging, I am far enough along that I made a trip out, had success, and wanted to get the readers up to speed on this endeavor. Before I get into my first excursion report, there have been numerous entities that have helped in one way or another to motivate me into the sport. Although I am fearful I will inadvertently omit someone, my ‘shout outs’ of appreciation go to; Brookfield Angler, CLE Kayak Anglers, KFGL, YakAddicts, Hook1, Lucid Fishing, Ocean Kayak, ACK, NRS, and The Backpacker’s Shop. I know many people will be curious what yak I bought and why. While that could be suitable for an entire post itself, I will just say the decision largely came down to the following… 1. Kayak weight vs. kayak weight capacity 2. Ability to handle a decent day on Lake Erie, yet small enough for creeks 3. Size as it relates to transport and storage when not in use. Other aspects were considered as well before making a final decision. A few weeks ago, a maiden voyage took place, but it was for an overall familiarization with the boat from comfort to safety. Today’s trip was for getting down to serious fishing business. I knew Wallace Lake (Berea, OH) had been stocked the prior week for a kids fishing derby yesterday. I was optimistic that the snotty nosed little brats (err… I mean little angels) hadn’t fished everything out the first day. My species of choice would be Rainbow Trout, but more importantly I just hoped to catch fish. Everything would be catch & release, other than the trout. It is doubtful there is much, if any, carryover. The first few hours on the water were not overly productive as I only caught a few small panfish. I saw a number of Largemouth Bass, some rather decent, but nothing could convince them to strike. I also came across a nice catfish resting in the submerged timber that I was only successful in waking long enough to swim away. So much of fishing success is knowing when to switch techniques or a pattern. It suddenly occurred to me that if I kept doing the same thing, I’d get the same result. I then paddled to the deepest portion of the lake, put a split shot above a small inline spinner and started casting. This was something completely different than I had tried all day. After letting my spinner sink for a few seconds, I began a slow retrieve. After 3 or 4 casts, I felt the smack of a fish hitting the lure and a minute or two later I had my first ‘real’ fish landed from the yak. 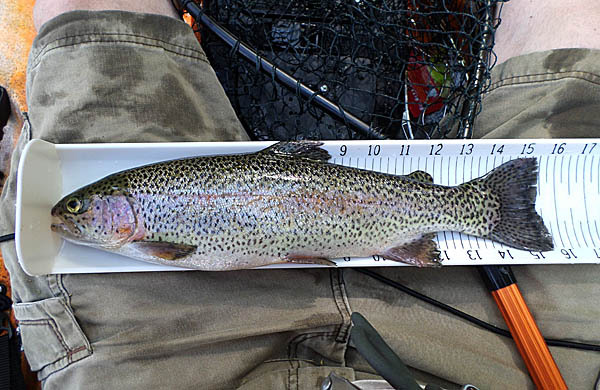 It was a dandy 15 3/4″ stocker Rainbow Trout. 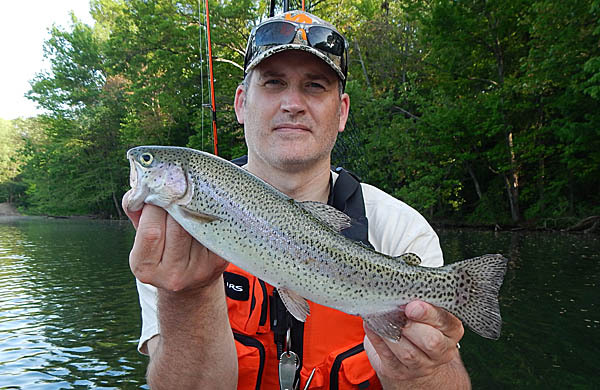 My experience with most trout stocking events is that the fish are 10-12″ and often drab in coloration and markings. This fish was nice in size and plenty handsome, I was thrilled. The next step was getting an opportunity to test my solutions for kayak self photos, and overall, I was pleased with the results. While I was content with the catch, I was eager to see if I could reproduce the success again. Fifteen minutes later, a second similar sized fish was guided to the net. 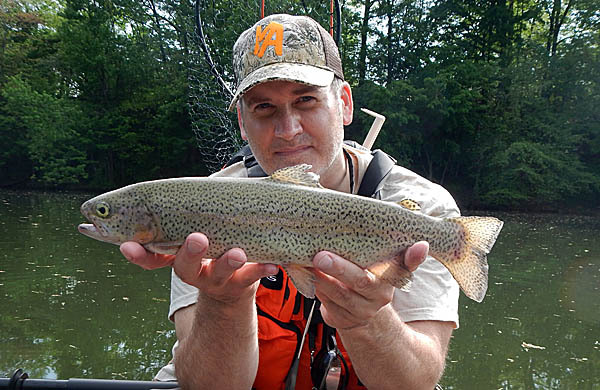 With complete confidence, a third trout was landed within 30 minutes of the second. My day was complete as I had my 3 trout limit on the stringer, but I did fish a bit longer. A fourth trout was caught and released, and I called it a day, I had achieved complete contentment. As I paddled to shore I thought about the fact that people could argue there are far more exotic locations and fish out there to be had, but this moment, this water, this day… was perfect to me. Congrats congrats congrats! I don’t care what kind of kayak you bought as long as it’s safe and suits your needs. From what I see and know, you did just fine. Don’t sweat the non-exotic location thing either. Spend as much time in waters you are comfortable on as you get to know your yak. The less you have to think about the kayaking part, the better. Thanks Nick, I’m sure I will have plenty of questions as I continue to move forward with everything. As much as time will allow, I do hope to be posting with some regularity on the kayak trips! A fish caught from a yak counts for 1.5 fish. Great job CWF! Thanks Andrew! I like the way you think! Oh wait, I think that means with my 3 fish limit I was over by 1.5 fish! Congratulations and welcome to the addiction. Kayaks open so much more water and locations for you. I never leave home without mine.